Throughout the year, there are several extra events that take place at the Walt Disney World Resort and Disneyland in California. These can be anything from a dessert party with preferred seating for fireworks, to preferred seating at a concert after a great dinner in an Epcot restaurant. Recently, for us, the special event was Mickey's Very Merry Christmas Party at the Magic Kingdom at the Walt Disney World Resort in Orlando. Mickey and Minnie head up Mickey's Once Upon a Time Christmas Parade. Photo by Bonnie Fink. This event is held each year during the Christmas Holiday season, usually from around the first part of November until nearly December 25. This year, specifically, the party is held on select nights beginning November 2 and ends on December 22. You can see more about when the select nights are and their cost here. 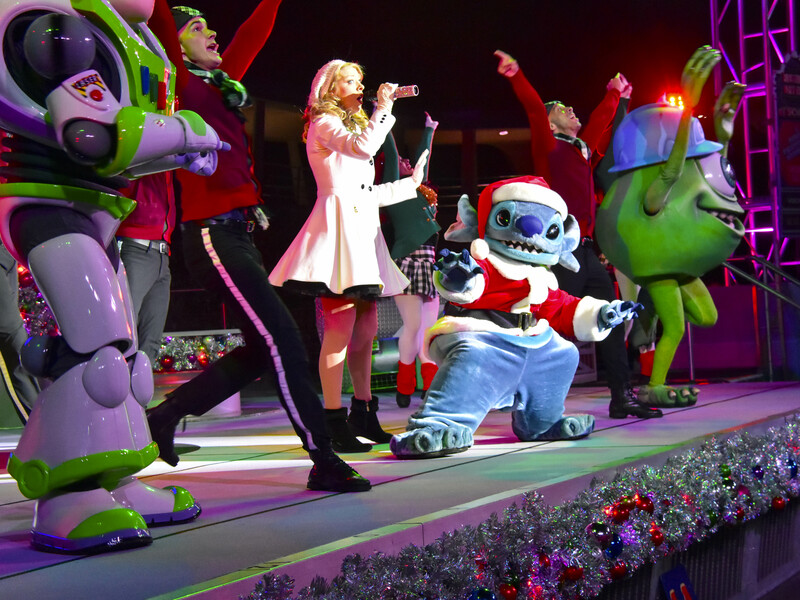 Singers and dancers—along with Stitch, Mike Wazowski, and Buzz Lightyear—entertain on the Rockettower Plaza Stage in Tomorrowland. Photo by Bonnie Fink. Without planned activities, it would be just another evening in the Park, and while that's plenty good for us, it seems to be more appropriate that a party should have stuff to do. There is pretty much non-stop entertainment from the beginning of the party at around 7:00 p.m. This is one visit to the Magic Kingdom where you'll want to be sure to pick up an event guide as you enter, and plan your evening. 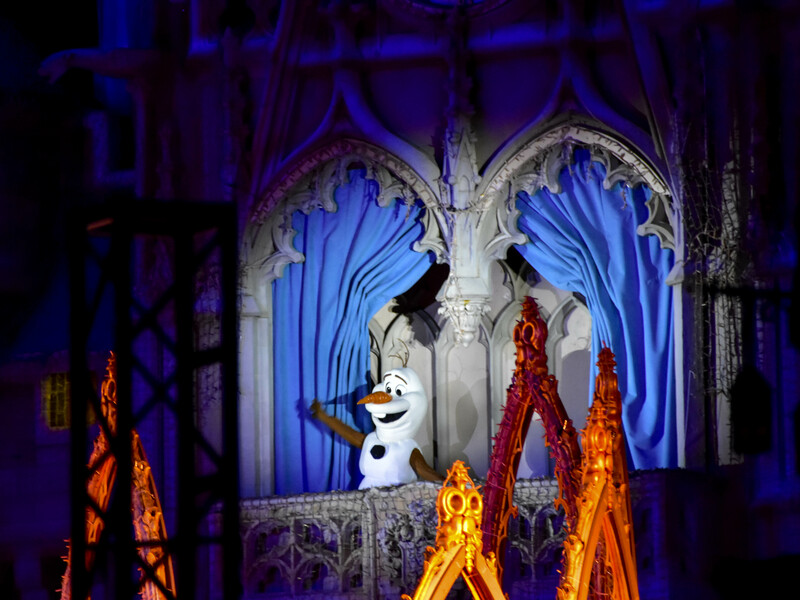 Olaf, from the movie "Frozen," makes an appearance before Mickey's Very merry Christmas Party. He's helping Queen Elsa change the castle to a sparkling icy centerpiece. Photo by Bonnie Fink. There are two shows at the Castle Forecourt Stage—the stage in front of the castle. The first is Mickey's Most Merriest Celebration, and the second is A Frozen Holiday Wish. On the night we were there, A Frozen Holiday Wish had one performance at 8:15 p.m., while Mickey's Most Merriest Celebration was seen at 7:40 p.m., 9:25 p.m., 10:30 p.m., and 12:00 a.m.
Another performance that seemed to be popular with the younger crowd was A Totally Tomorrowland Christmas at the Rockettower Plaza Stage in Tomorrowland. This show featured Buzz Lightyear, Stitch, and Mike Wazowski, plus singers and dancers. It too had several performances and many were at the same time as the shows on the Castle Forecourt Stage. It paid off to consult our guide early in the evening for the best strategy to see everything. 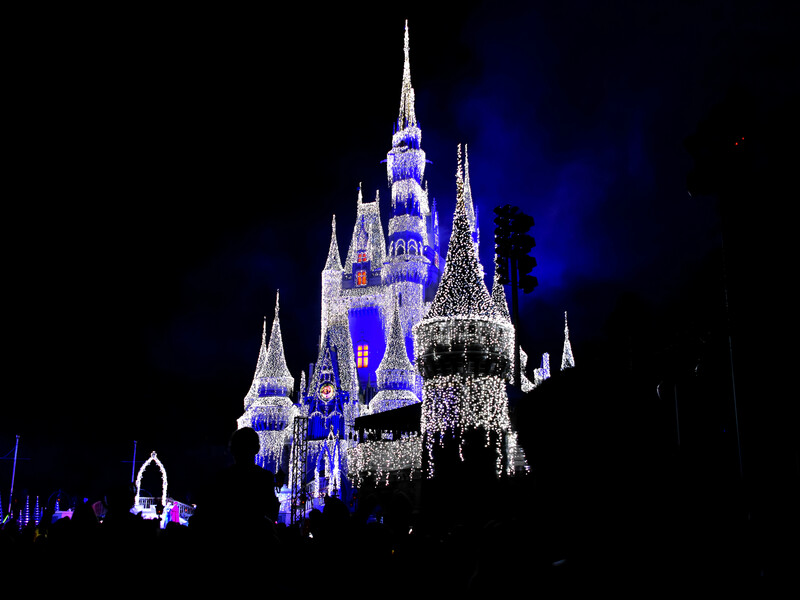 Cinderella Castle is always the center of attention at the Magic Kingdom, but during the holidays it will leave an impression you will never forget. Photo by Bonnie Fink. Club Tinsel – A DJ style dance party complete with characters at Cosmic Ray's Starlight Café. VoicePlay – An a cappella Christmas concert at the Rockettower Plaza Stage. 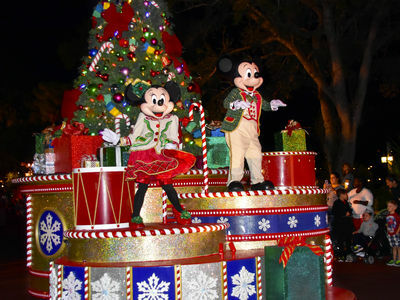 Mickey's Once Upon a Christmastime Parade – This parade was a main event of the evening for us. There were two performances: one at 8:30 p.m. and again at 11:00 p.m. Like many parades at the Magic Kingdom, it begins at Frontierland and ends up exiting on Main Street near the fire station. It's only performed on the nights of the party until the week before Christmas, when it begins showing on normal nights. 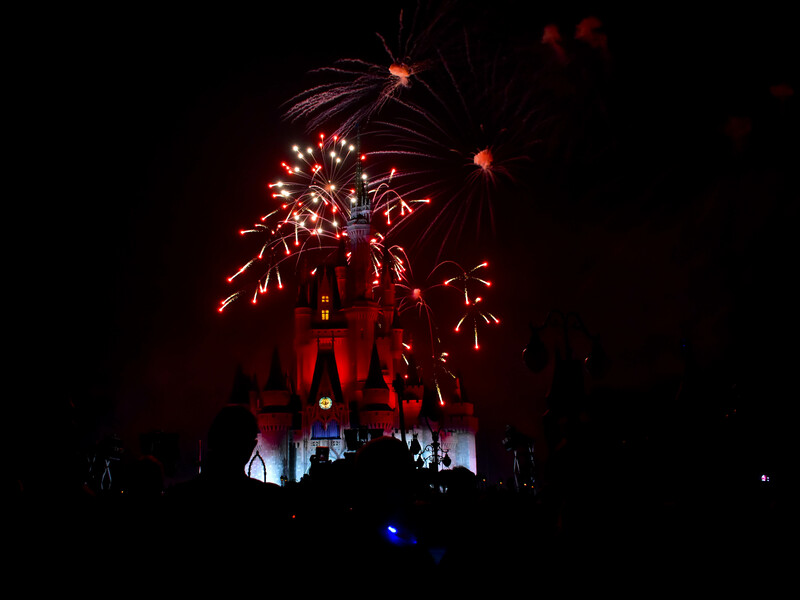 Holiday Wishes – This is the firework event of the night. Held only once, it usually begins at 10:00 p.m., but consult a guide for specific times for the evening. Disney is very fluid in their scheduling and things can change from day to day. In any case, this firework display is a must see if you attend this party. It's worth it. Nearly all the eating establishments are open for business during the party, so food is available as it always is at the Magic Kingdom. 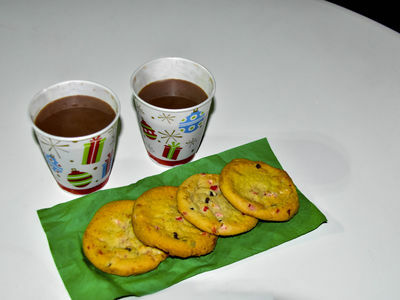 In addition, each land has a special location set aside where party goers can enjoy cookies and hot chocolate on the house. Each land has a different cookie. The hot chocolate is the same. During Mickey's Very Merry Christmas Party, locations throughout most of the lands of the Magic Kingdom give out complimentary treats. This year it was cookies and hot chocolate. In this image, we were about to enjoy Peppermint Bark cookies from The Launching Pad. Photo by Bonnie Fink. We didn't try them all. That would have been a lot of cookies and hot chocolate. Other locations have holiday inspired specialty foods that would be worth a try too. Sleepy Hollow has a pumpkin waffle sundae while Gaston's Tavern has holiday tree cupcakes—a fun little white cupcake with green frosting and sprinkles, resembling a Christmas Tree. Plaza Ice Cream and Main Street Bakery also have specialty items that could be fun if you need more sugar. If complimentary cookies and specialty pastries aren't enough, there is a dessert party offered at the Magic Kingdom during Mickey's Very Merry Christmas Party. Wishes Fireworks Holiday Dessert Party at Tomorrowland Terrace is offered at an extra expense, but seems to be popular. In fact, we're only mentioning this because it's something worth considering if you plan to attend next year. Our quick search of the reservation page shows that they're sold out for this year. We haven't attended this event but we've been to the non-holiday version, the Fireworks Dessert Party at Tomorrowland Terrace. And yes, it was worth the extra money. This was our second year to attend Mickey's Very Merry Christmas Party. Admittedly, this event is geared towards younger folks, with the Frozen inspired show, the DJ at Tinsel Club, and so on. But it certainly doesn't leave us feeling out of place when we're there. There is plenty to do, see, and of course, eat, and we're up for pretty much all of that. 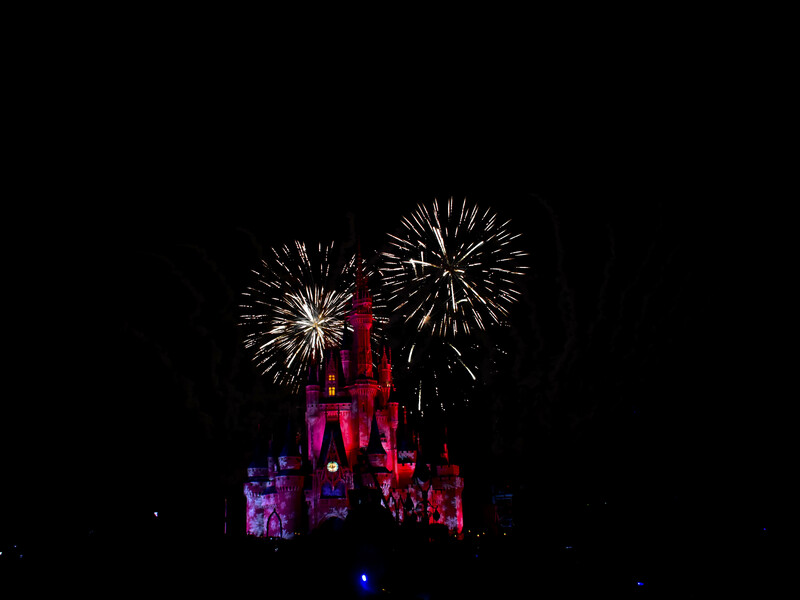 The fireworks are, for us, the highlight of the evening when we're at the Magic Kingdom, and when a special event is involved, there's often a special show. At Mickey's Very Merry Christmas Party the fireworks show is called Holiday Wishes – Celebrate the Spirit of the Season. Like the normal Wishes show, this display is narrated by Jiminy Cricket. Fireworks at Disney are so beautifully orchestrated it's hard to remember that many of them are more than a mile away from the Castle on back roads of Disney property. Of course, you can just not worry about the technical details and enjoy the show. Photo by Bonnie Fink. 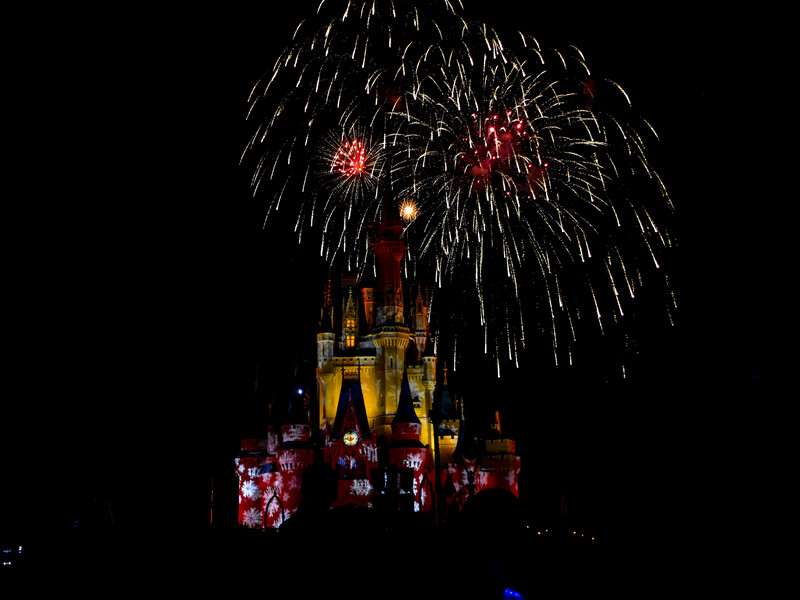 Fireworks at the Magic Kingdom are never trivial, but the show during Mickey's Very Merry Christmas will put you in the Christmas mood. Photo by Bonnie Fink. When viewing any fireworks show at the Magic Kingdom, it's easy to think you can see them from anywhere. While that's true, you should consider being near the castle whenever you can. 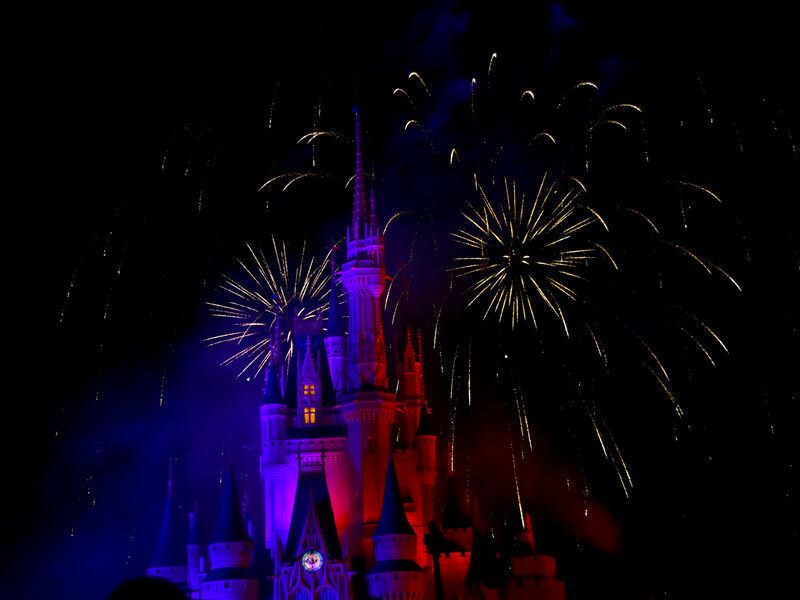 With Disney's recent innovations in lighting, the castle is as much a part of the show as the fireworks themselves. Photo by Bonnie Fink. Don't turn away. You'll certainly miss something wonderful. 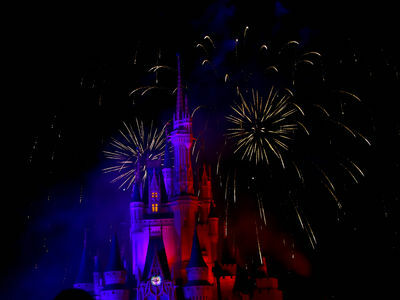 While the fireworks are blasting overhead, the Castle puts on a show of its own. Photo by Bonnie Fink. 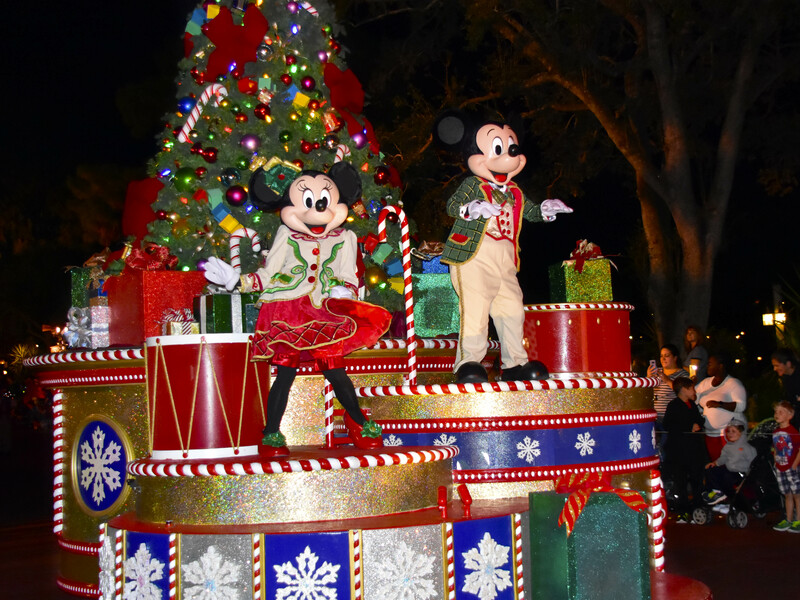 Last year, when we wrote about Mickey's Very Merry Christmas Party, we pointed out that as a value it made good sense to spend the extra money to come see this event. As annual passholders, it costs us extra to attend these things, but we believe it gives us extra value in our Disney experience. If you're not an annual passholder, it can work out to be cost neutral. If you were on a multi-day park pass, for example, you could pick other parks to visit during your stay and save the Magic Kingdom for the evening of your tickets for Mickey's Very Merry Christmas Party. The party starts at 7:00 p.m. but you can get in at 4:00 p.m., and it runs until midnight. It's almost like a two-for-one. Admission to the park and a fun party with several special events that you normally won't see at the Magic Kingdom. Of course, to be clear, admission to the park during the day would still be at an extra expense. 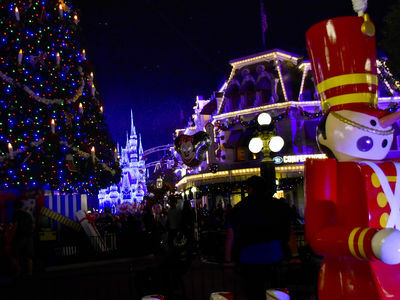 Ice Castle in the background, Christmas Tree in Town Square, and toy soldiers guarding the presents all around. Disney's Magic Kingdom is the place to be during the holidays. Photo by Bonnie Fink.